I was deep into the Burroughs-ian segment of my “beat” education by the time I began negotiating my first employment contract. It was too late. Burroughs had already embedded the idea that words were viruses and that I might have to rip the whole thing apart to get to the bottom of what it all meant. It didn’t help that they use words like “inured” and then tell you, “Oh, it doesn’t mean what you think it does. In legal terminology it means something else.” Well…uh…yeah! 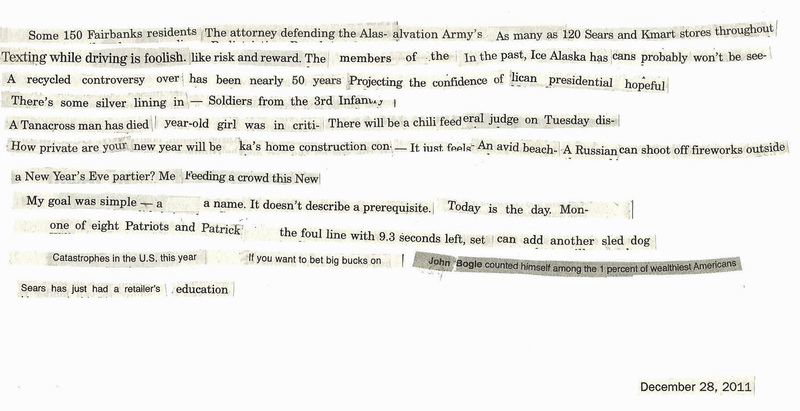 This entry was posted on December 29, 2011 by AK in 365 Days of Print, alaska, art, collage, Fairbanks, musings and tagged 365 days of print, alaska, art, collage, cut-up technique, daily news miner, Fairbanks, william s burroughs.